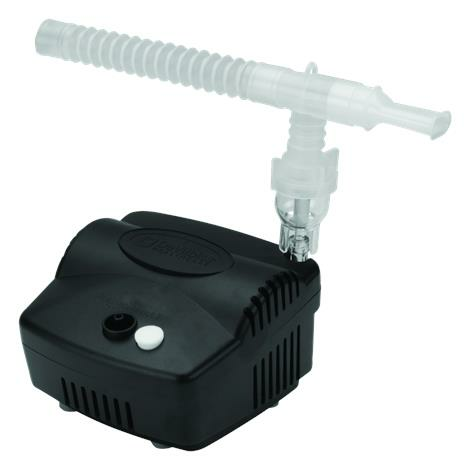 Devilbiss PulmoNeb LT Compressor Nebulizer System is an exceptionally sleek, small and lightweight compressor that offers optimal performance with the VixOne Disposable Nebulizer. It is a complete system that provides a reliable high flow output for fast, efficient treatments. Small footprint and lightweight design make it easy to store and take along. No internal tubing helps improve reliability and reduce the chance of leaks. How to use PulmoNeb LT Nebulizer Compressor? When it comes to low cost and high-performance compressor nebulizer systems, the PulmoNeb LT fits the bill. This advanced yet affordable unit was developed to compete with the other low-cost systems. However, it not only competes, it exceeds the expectations by delivering superior performance that makes it one of the best low cost systems in the market. While developed to deliver superior performance, this advanced compressor system does not carry the superior price. Ensure the power switch is in the off position. Place compressor on a level, sturdy surface. Never block air vents or place compressor on a soft surface, such as a lap of patient, or a bed or couch, where the air openings may be blocked. Plug power cord into wall outlet. Connect one end of the nebulizer tubing to the compressor air outlet connector. Note - During high-humidity weather conditions, condensation (water build up) can occur in the nebulizer tubing. If using an aerosol mask, insert the bottom part of the mask directly into the top of the nebulizer cup. Press the power switch to start compressor. Place the mouthpiece between teeth. With mouth closed, inhale deeply and slowly through the mouth as aerosol begins to flow, then exhale slowly through the mouthpiece. If treatment needs to be interrupted, simply press power switch and place the nebulizer into nebulizer holder. If an aerosol mask is used, place the mask over mouth and nose. As aerosol begins to flow, inhale deeply and slowly through mouth, then exhale slowly. When treatment is complete, turn the unit off and unplug it from wall outlet. 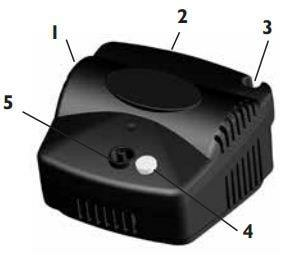 How to clean VixOne Nebulizer? Wash all items, except tubing, in a hot water/dishwashing detergent solution. Using a clean bowl, soak items in three parts hot water (131ºF-149ºF/55ºC-65ºC) to one part white vinegar (>=5% acetic acid concentration) for 30 minutes OR use a medical bacterial-germicidal disinfectant. With clean hands, remove items, rinse under hot tap water, and air dry. Store in a zip-lock bag. Note - Do not towel dry nebulizer parts; this could cause contamination. Keep the outer surface of the tubing dust-free by wiping regularly. Nebulizer tubing does not have to be washed because only filtered air passes through it. Replace your DeVilbiss primary reusable nebulizer every 6 months. Disposable nebulizer (often used as a backup) should be replaced at least every 15 days. To ensure consistent operating specifications, replace with DeVilbiss nebulizer. How to clean PulmoNeb LT Compressor? With power switch in the off position, unplug power cord from wall outlet. How to change PulmoNeb Filters? Remove the filter by grasping it firmly and pulling out of the unit. is an adapter avaiable to use this in an auto? Sorry, we do not carry adapter which can help you to use Devilbiss PulmoNeb LT Compressor Nebulizer System in an auto. Is a carrying case available for this product? Please refer to below link showing carrying case for PulmoNeb LT Compressor Nebulizer System. may I order #3655LTR and extra filters for it through the mail--if I can please tell me the information I will need to do that. Yes you can order 3655LTR and extra filters. You can buy extra replacement filters for PulmoNeb LT Compressor Nebulizer from our site given on below link. What is the difference between 3655LT and 3655LTR models? Do they use power from outlet? Devilbiss PulmoNeb LT Compressor Nebulizer System item #3655LT comes with VixOne Disposable Nebulizer and item #3655LTR comes with VixOne Disposable and Reusable Nebulizer. can you use an adapter for the car lighter to run this machine? Do not use PulmoNeb LT Compressor with a DC to AC converter, or with any AC voltage and/or frequency other than specified. However We have DeVilbiss Traveler Portable Compressor Nebulizer System that can safely run on both AC and DC and battery power and is perfect for traveling. my mother uses your nebulizer she needs to fly and won't go without having one. What battery one would you recommend? Thank you for inquiry. The Devilbiss PulmoNeb LT is tested to at least 1000 hours of life. Battery is not required. Thank you for reaching out to us. This does not run on battery. Generally, we do not recommend using extension cords with this product. I have misplaced the instruction booklet. Where can I download a copy of this? Please find the instructions in the product pdf.